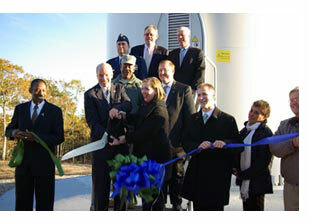 10/28/2011 - WASHINGTON (AFNS) – Under Secretary of the Air Force Erin C. Conaton visited the Joint Base Cape Cod (JBCC) in Cape Cod, Mass., today, for a ribbon cutting ceremony for two new wind turbines. The 1.5 megawatt wind turbines, in addition to an existing turbine, were built to offset electrical costs for powering numerous groundwater cleanup systems at the reservation. The turbines will pay for all the Air Force’s electric needs for groundwater remediation at JBCC, saving more than $1.5 million per year. 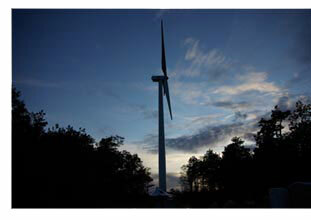 They will also offset emissions generated by fossil-fueled power plants, reducing the Air Force’s carbon footprint. As the Air Force Under Secretary, Conaton is responsible for ensuring the Air Force has what it needs to perform its missions in support of national security. Dependence on fossil fuels can be a liability in both supply and cost, generating the need to decrease demand and diversify supply sources. 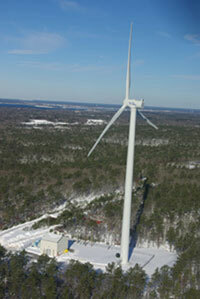 The wind turbine project is an example of an Air Force initiative to meet this need. “The Air Force currently operates 85 on-base renewable energy projects at 43 installations, playing a significant role in the national strategy to establish greater energy security via conservation and alternative energy use,” Conaton said. According to U.S. Environmental Protection Agency reports, the Air Force is the third largest purchaser of green power in the federal government. Mission Statement: The Energy Committee is comprised of representatives of various Commands and tenants. The purpose of the committee is to facilitate energy conservation and use of renewable energy technologies in order to reduce operational costs and minimize the carbon bootprint. Goals include increasing energy awareness through education; help meet the intent of Executive Order 13514; and advise the Joint Oversight Group on matters related to the JBCC Energy Policy.